I'm terrible at keeping a decent sleep schedule. I love my job and I often stay up late working on my latest story. Sometimes, I decide to relax with a videogame, I lose track of time, and suddenly it's 4 AM. I know, however, that getting enough quality sleep every night is key to a healthy lifestyle, which is why, over the past month, I've tried to wake up earlier and work out in the morning. With these personal changes, motivation only goes so far for me. I want to be able to visualize my progress and current streak. Since getting an Apple Watch Series 2 a couple of weeks ago, I've started looking into the idea of using it as a sleep tracker again. There are some solid options on watchOS, but all of them require pressing a button in an app right before you're about to sleep. And because I normally drift off to sleep, I forget to activate sleep tracking mode and no sleep gets tracked at all. In my limited tests with a Fitbit this month (before getting a new Apple Watch), I came away thinking that automatic sleep detection was my favorite feature of the product. You don't have to press anything and the Fitbit figures out when you started sleeping and when you woke up. Combined with a dashboard like Gyroscope, it's a great way to build an automatic sleep log that passively monitors your sleeping habits. 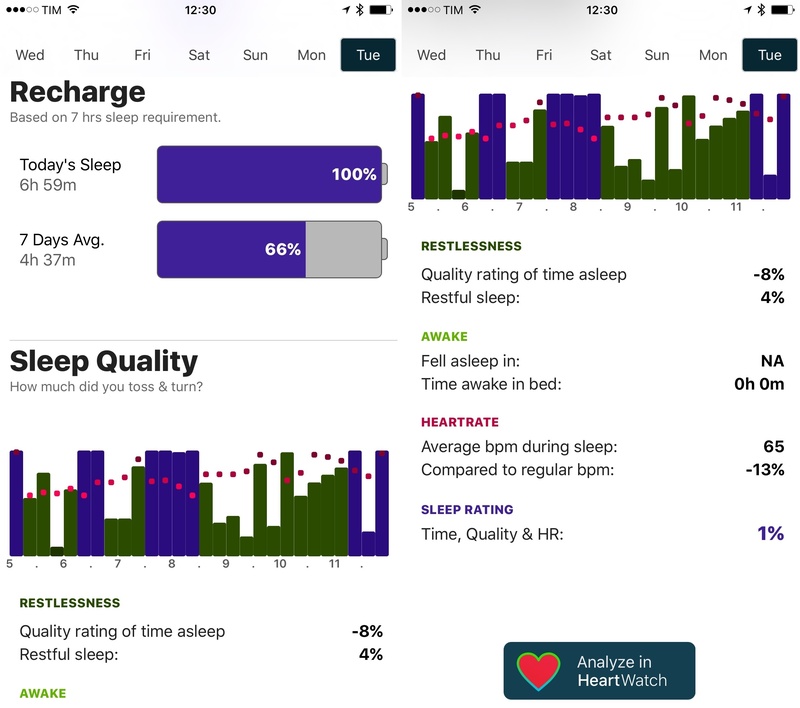 David Walsh, developer of MacStories favorite HeartWatch, wants to recreate the same experience with AutoSleep, an iPhone app that turns your Apple Watch into an automatic sleep tracker without installing a Watch app. I've been wearing my Watch to bed for the past week, and AutoSleep has worked surprisingly well. AutoSleep doesn't install any app on your Apple Watch and you don't have to interact with it before going to bed. The app's instructions make it clear: if you want to use your Apple Watch as a sleep tracker, you just need to wear it and sleep. That's it. No toggling of on/off modes, no menus to confirm in the morning – nothing. AutoSleep's whole selling point is that you install the app and forget about it. 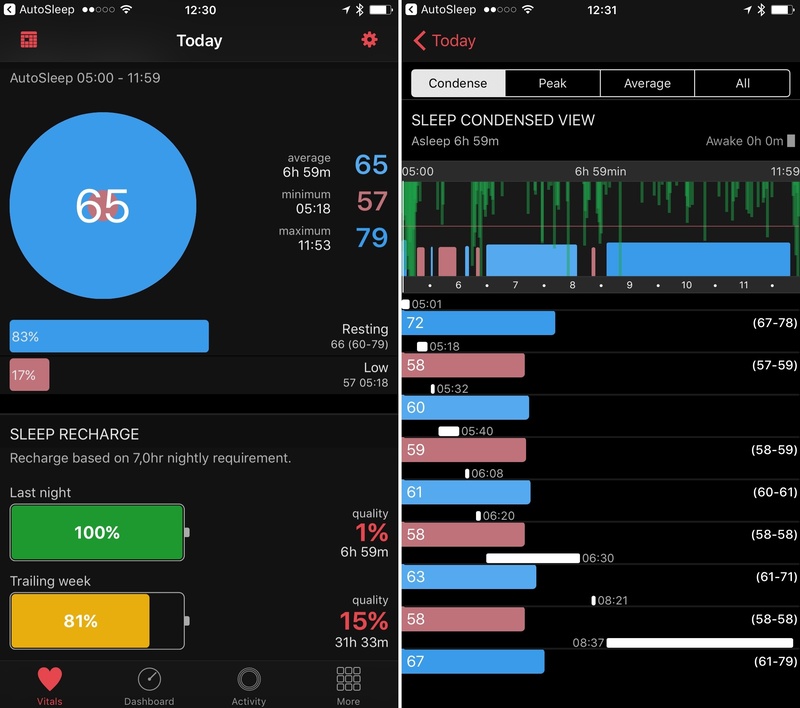 On the iPhone, AutoSleep employs an algorithm based on advanced heuristics using HealthKit and iOS frameworks to monitor motion data from the Watch and the iPhone. The app understands when you were sleeping and when you woke up, and it presents the results in a unique clock interface that packs a lot of information. As long as the Watch is on your wrist and AutoSleep has been configured to infer your sleep times, the app can also correlate data about sleep quality (based on movement) and heart rate (from the embedded sensor in the Watch) to tell you how you slept. To offer this kind of invisible experience, however, Walsh had to include settings to train AutoSleep to correctly guess your habits. For instance, you can tell the app to only detect sleep within pre-selected start and end times: if you set AutoSleep to monitor sleep between midnight and 7 AM, it won't detect as sleep two hours spent being still during class. You can also adjust the sleep detection level with a slider that goes from 'Still' to 'Restless', and you can tell the app that your iPhone isn't likely to be touched or moved at night. Furthermore, you can choose to treat the first iPhone unlock after a certain time in the morning as the final signal that you're awake and want to be notified of logged sleep time. Configuring some of AutoSleep's settings. 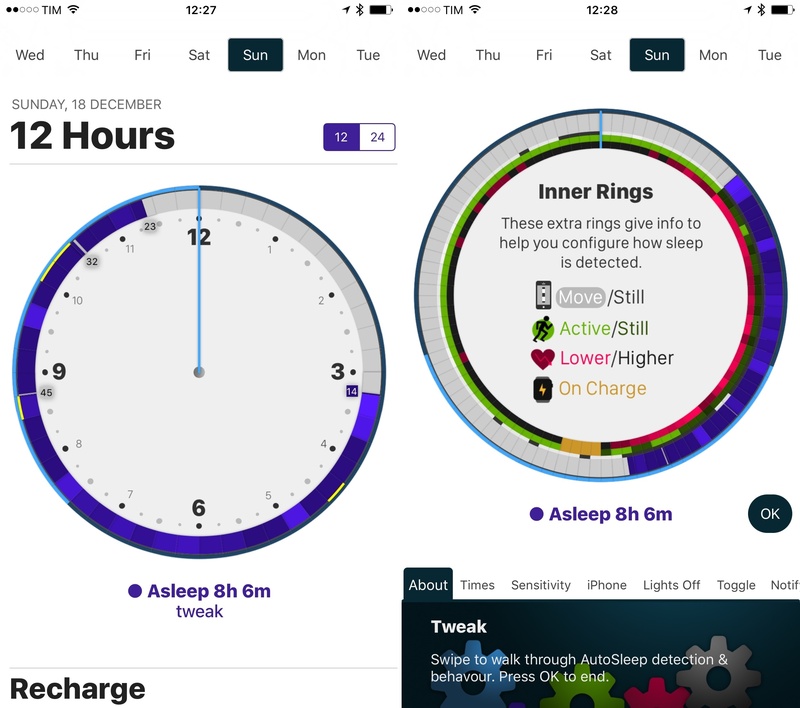 In the main app, AutoSleep uses a clock interface (with an Apple Music-inspired page layout) with colored rings and blocks to represent different bits of data captured by HealthKit. Asleep time is indicated with purple blocks, where lighter purple means deeper sleep; this is calculated by considering physical movement (displayed as an inner green ring) and heart rate (a red ring). In deeper stages of sleep, your heart rate will likely be lower than usual and you'll see a lighter red color block in the associated ring; by contrast, light green indicates you were restless, which tends to be paired with dark purple (light sleep). Once you make sense of what the colors mean and the connections between them, you can see why Walsh opted for this clock design – it's a clever way to plot sleep times against activity and heart rate data measured during the day. However, I often felt like AutoSleep's clock UI was preventing simple interactions with my data – almost as if I couldn't get past the initial learning curve of clock rings and blocks. I think AutoSleep's interface should be simplified, making it easier to discern the meaning of colored blocks and how they can be manually edited if the measurements are wrong. Reading and editing the clock UI in AutoSleep 1.0 feels somewhat over-engineered – a stark contrast with the app's straightforward premise. A FAQ this long shouldn't be necessary, and the app should have a superior onboarding process to let users learn its concepts. AutoSleep's biggest issues in this first version, though, are the lack of settings for "special days" that don't follow a standard routine (like weekends or vacations) and the trade-offs for people who don't want to wear a Watch at night. 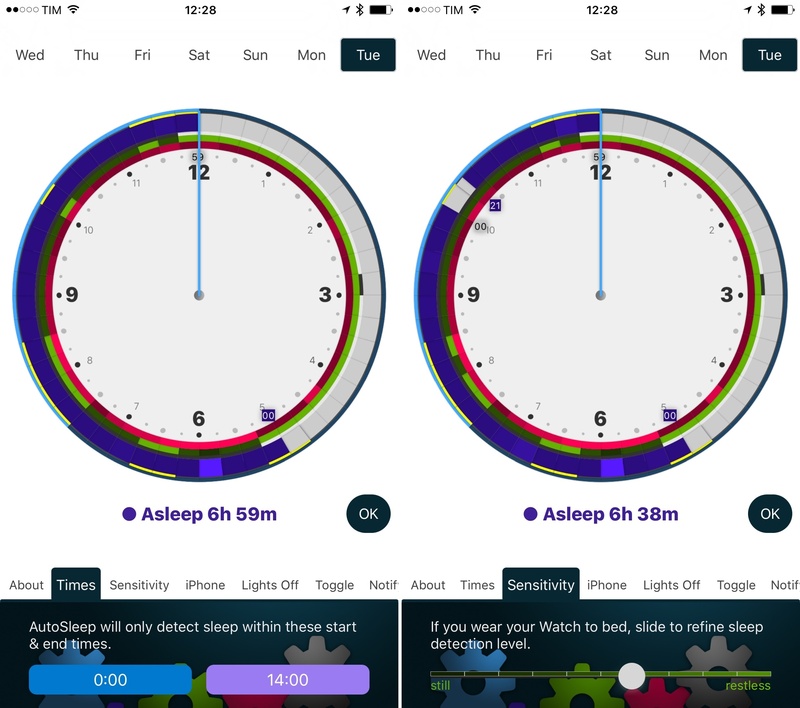 AutoSleep can also calculate sleep times based on motion recorded by the iPhone, but the app loses the ability to compare sleep times with heart rate and movement measured by the Watch. 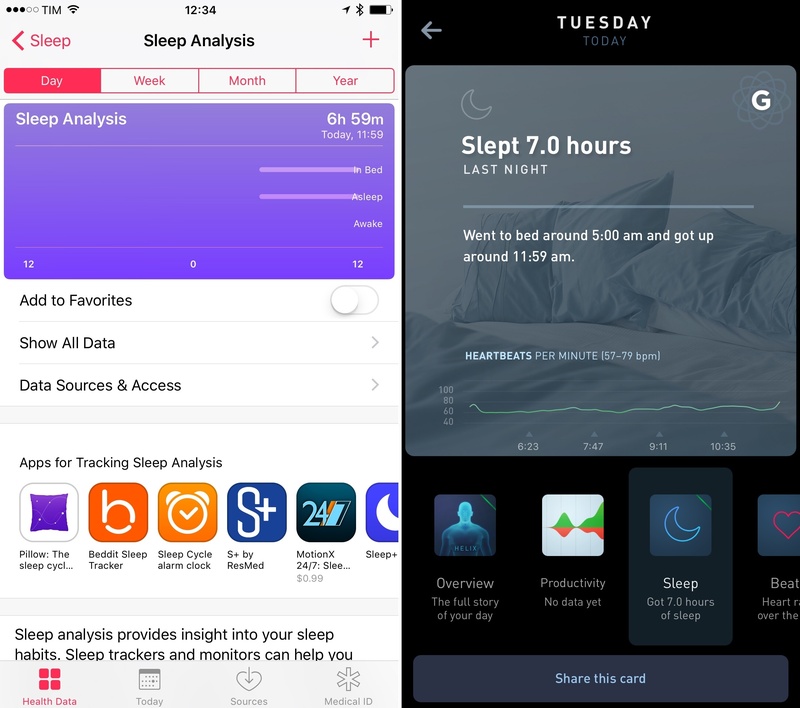 Much of AutoSleep's appeal is lost if the Apple Watch isn't used as an automatic tracker, and there are dozens of other iPhone sleep tracking apps with easier interfaces, superior reporting tools, and alarm clock features I'd recommend instead. Viewing AutoSleep's data in Walsh's other app, HeartWatch. The way I see it, the best way to enjoy AutoSleep is to use it as a mission control center for sleep times on the iPhone while you're wearing the Watch to bed. In addition to not having to worry about anything else, you'll end up with overnight heart rate data alongside an accurate representation of how much you tossed and turned. These stats and their averages are available in the 'Sleep Quality' section at the bottom of each day in AutoSleep, and they can also be viewed in more detail in Walsh's excellent HeartWatch app on the iPhone. I've worn the Apple Watch at night with AutoSleep on the iPhone for over a week now. The iPhone app works in the background and it does a good job at using data captured by the Watch to understand how much I've slept, the quality of my sleep, and when I've gotten out of bed. I've also appreciated the fantastic battery life of the Apple Watch Series 2: I can wear the Watch all day, keep it on while I sleep, and I still wake up to over 60% of battery left. As a follower of the Underscore Watch Charging Method, I charge the Watch while I take a shower or prepare lunch – the Series 2 makes a second evening charge unnecessary. AutoSleep data in Apple Health and Gyroscope. AutoSleep is one of the reasons I'm happy to have an Apple Watch again. The app is building an automatic sleep log that is archived with HealthKit and made accessible to other health apps I use such as HeartWatch and Gyroscope. AutoSleep isn't for everyone and there's lots of room for improvements in the design department, but if you've been looking for the easiest way to turn the Watch into a Fitbit-like sleep tracker, AutoSleep is the app you need to try. For a limited time, AutoSleep is available on the App Store at a launch price of $1.99.